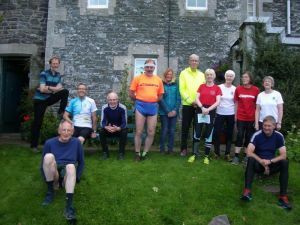 Claire and Roger Garnett were kind enough to invite the ESOC membership back to their Manor Valley home for the annual run. Perhaps still recovering from the S6D or other reasons, this year's turnout was a little down on previous occasions. Roger and Claire thought that there would be a nil turnout as arrivals were very slow, but numbers did pick up. 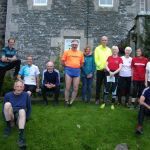 13 of us went out on some form of athletic activity, Bill and Martin on the long run; Janice, Ian, Mark and I did a shortened version of the long run; Anne, Janet and Eleanor did a short run; with Brian, Maureen, Fiona and Robert doing a short walk. Unlike last year, none of the younger generation were there to leave us for dead, so going slower all the time seemed very apt for me at least. The evening was very warm and sunny and a very bright moon when we left. Plenty food and refreshments followed; there’s always a high propensity for seconds at the Manor Valley run, such is the high quality of the fare provided! No birthdays this year, or indeed musical accompaniment, but discussion about the S6D just finished and many other topics provided us all with a very pleasant evening. Martin made his first visit to this social; I’ll bet he’ll be back next year. A GPS plot of the run. See what you missed! Immense thanks to Claire and Roger.